We have seen some gadgets that propel with solar system in our earlier posts, it is the technology which necessitates being inevitable in the contemporary days and the days coming. Here is a list and detail about eco friendly gadgets which are going to play important part in our day to day life. As electric devices may expensive and consume unnecessary energy and needed uninterrupted power flow let we look over an alternate to electric power generation = Solar System. This post is for you, in a motive to not only make use of it but also an idea - how to make it built by yourself with retrived materials – do it yourself. 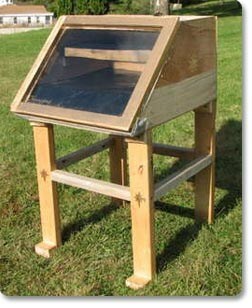 Solar food Dehydrator just dries the fruit, vegetables, and other food items by the sun powered technology that does the job of Electric Food Dehydrators. As Drying is a form of preservation. It was created as a project at Maharishi University of Management in Fairfield, Iowa made up of entirely of recovered materials. It was constructed with scrap ply wood, 2x4s from an old ladder, a house window, and other items which could be considered trash. 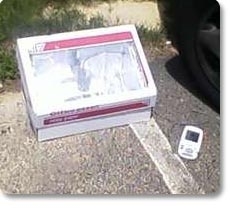 Solar Oven that can reach up to 120 degrees in Fahrenheit, make it built by recycling most of the parts from unused office supplies.